Subscribe to the Mailing List to stay on top of what’s going on at Riding in the Zone. Occasional newsletters with offers and event notifications. BTW, I will NOT SELL your email address to anyone…promise. I am flailing away on my own experiences with USCRA vinvt. racing, book is in production but I am doing a quick rewrite, it figures the Talabachs, Greg Nichols, and our (once) fairly unbeatable Ducati 350, Todd Henning and Dave Roper always near. Circe ’96-’98, plus pictures. The delays on this have been constant but hope to hae in my hands by September. Great day at the track yesterday, Ken! I learned tons!! BTW, the newsletter signup function appears not to be working. Having read your MCN articles over many years, and having copies of your books, I am keen to stay with your motorcycling publications. Trying to subscribe to new letter. I receive a message to fill in more of the form. I only show the email box to fill in. Ken -Thank you in advance. You’re comments on aging are right on the money. There’s no reason that an individual can’t keep riding into their seventies, assuming no catastrophic health events and that they keep fit. After riding many different types of bikes on the street for many years, I did my first track day at 60, and was fine with it. I approached it as a learning experience and have specific goals in mind, but would rather learn to do it correctly on the track before trying to do it faster. I am 55 years old and have ridden on / off for 30 years. it has been 5 years but I am looking at getting back into the mix. I have the yearn for a sport bike and new type of riding. I am in decent shape, go to the gym 3 plus days a week. I am trying to figure out is this something I should do or a whim of past fun and Glory. I have never owned a sport bike and want to consider the track side. I am going to take the safety course and go from there. You’ll only know whether getting back into riding is right for you by moving forward. The safety class is the absolute correct thing to do. Too many returning riders fail to realize that they may not know what they need to know to stay safe and to not scare themselves. From there, get yourself a smallish sportbike, such as a Suzuki SV650. I suggest this bike because it is competent, inexpensive machine that is capable as a track day bike with a few modifications. It’s not a supersport bike like an R6 or CBR, or ZX6R, but the SV is a good choice for a first sportbike. Give yourself a couple of solid months on the bike and then come to the track. You’ll discover the thrill of focused sport riding without the risk of cops, cars, etc. Jerry, Did you see the video of me riding a Ninja 250 on the racetrack? Ask nicely if you can borrow your wife’s Ninja and come play. 63 and loving my Gixxer. Great track day at New York Safety Track in June. I look forward to reading your blog. Your articles I have read are great. Maybe next season I will get a chance to pick your brain on the track at 1 of TTD’s. 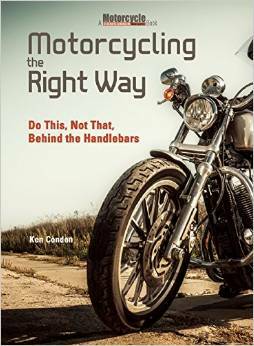 Ride on and be safe..
Ken I first would like to commend you on the book you put together (Riding in the Zone) its well thought out and I see a value in reviewing it time to time. Great Job!! Ken I believe your 2 most important factors of speed and being seen are right on target. I have witnesses in the 8 years of riding on the street the same type of motorcycle accident at least 4 times… Which is a stopped motorcycle being rear ended. High Vis may have prevented this type of accident possibly. I now find myself projecting my stops points and start by slowing the vehicle down behind me by decreasing my speed before the stop point. Your post on speed is as always right on as well! Thanks Jim. I agree that rear end collisions are a problem, although statistically, they are rather small compared to the typical collisions from the front. I myself was rear ended when I was in my 20s, riding my 1971 Triumph Bonneville. I appreciate any help to make me a better rider, older rider. Hey Ken – glad to hear of this latest endeavor. I always read your stuff n MCN. Please note I signed up under a new email as the old one got to be useless. Ken, can’t wait to read your tips and techniques on riding my motorcycle. Should be like track day classroom tips online. Keep up the great work. Thanks Bill. I’ll try not to disappoint.